YAOUNDE, Cameroon--Those seeking refuge from violence in the Central African Republic are turning to nearby Cameroon for sanctuary. Since December, around 85,000 displaced individuals have flooded the country. However, insufficient resources prevent it from being the safe haven they need. Between April 14 and May 19, 29 children (infants to nine-year-olds) have died en route to Cameroon. The weeks-long journey from CAR is difficult and leaves many refugees severely malnourished. Some are already wounded due to CAR violence. Other conditions include hypothermia and dehydration. Operations backed by the World Food Programme and the UN Refugee Agency are attempting to provide food, shelter and medical care, including vaccinations. The Regional Refugee Response Plan, which along with Cameroon also assists Chad, the Democratic Republic of the Congo, and the Republic of the Congo in handling refugees is severely underfunded. More than 2,000 refugees continue to trickle into Cameroon. The number is down from around 10,000 per week -- not because there are fewer refugees, but because main roads are now blocked by anti-balaka, Christian militants. The flow of refugees coincides with the beginning of the rainy season. As well as causing a deterioration in housing conditions, this can also result in the spread of diseases. CENTRAL AFRICAN REPUBLIC, Africa -- Violence among Christian and Muslim militias in the Central African Republic (CAR) remains alarmingly high. Despite intervention efforts, death and displacement continue. In this troubled environment, there have been reports of cannibalism as well as revenge-killings targeting children. Ouandja “Mad Dog” Magloire, a Christian, has admitted to beating and stabbing a Muslim man before dousing him with petrol, setting him on fire, and eating parts of his body. Magloire claims revenge as his motive, saying that Muslims had killed his pregnant wife, his sister-in-law and her baby. The victim of cannibalism, who was attacked in broad daylight by Magloire and approximately 20 other men, was not personally connected to Magloire’s losses. Other revenge crimes involve children who are mutilated or beheaded. Over 130 children have been killed or maimed since January, usually in machete or knife attacks. These are clearly crimes against humanity, but there is no justice system currently stable enough to hold anyone responsible for their actions. Not only are children preyed upon in retaliation attacks, they are also often recruited into armed groups. During the evacuation and displacement of over 500,000 individuals, already-vulnerable children are more likely to be unattended and harder to protect. Hope may come in the form of Catherine Samba-Panza. She was elected in January to serve a one-year term of interim president while the CAR, hopefully, gains stability. She has no connection to either Muslim or Christian groups and urges both sides to lay down their arms. So far, nobody seems to be listening. CENTRAL AFRICAN REPUBLIC, Africa - I first wrote about the Central African Republic’s deplorable conditions in September, and the situation has worsened since. Luckily, the international community has recently made much larger efforts to step in, intervene, and restore stability but there is still immense and lofty work to be done. From December 5th through 7th, UNICEF reported that within those 72 hours alone, 60,000 citizens were displaced and 394 were killed. At this point a week ago, the internally displaced persons count had risen to half a million people. After this extremely deadly period of three days, France finally decided to send in troops to this area and militarily push to end the conflict. Although international presence may help resolve this conflict in the main hotspots, the destruction and horrors are continuing across the country in small villages and areas isolated from help. IDP camps are popping up across the country, and as they do, these displaced persons also lack access to adequate shelter, sanitation, food and water. These problems are thus mounting and exponentially piling on top of one another, so more must be done before the damage is irreversible and before more innocent people die. This international intervention also follows the successful work by the UN and MONUSCO to shut down the M23 rebels in the Democratic Republic of the Congo, so this could hopefully be a precedent for how to end the rebellious conflict in the Central African Republic. If the UN and its diverse troops were able to tackle several conflicts such as these, this may set a much needed tone for African states that murderous rebels will not be tolerated. CENTRAL AFRICAN REPUBLIC, Africa - A few United Nations agencies have released new reports that disclose the dire statistics of the current status of the Central African Republic (CAR). 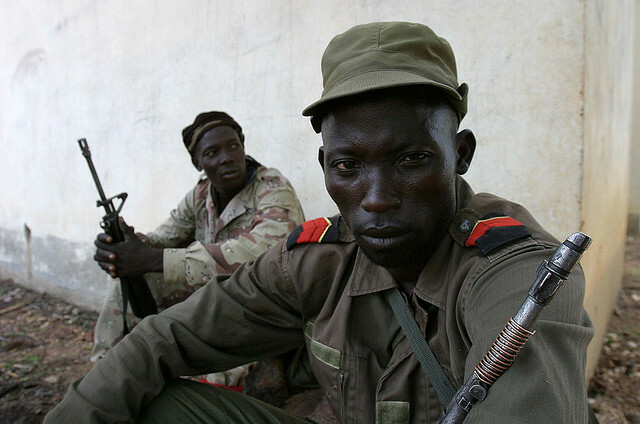 Although a peace agreement was reached in January between the national government and the Séléka rebel coalition, the rebels soon reclaimed the capital of Bangui and have since repeatedly stirred up violence and lawlessness through the volatile country. The newest UN reports reveal that villages are still being burned to the ground by armed militants which has forced thousands to flee their homes and seek basic human necessities. It is has been calculated that over a third of the country's population of 4.6 million people are in desperate need of food, shelter, healthcare, water, protection and sanitation. This is clearly a huge humanitarian crisis, and poses a threat to the ever-increasing unstable region. The DRC to the south has its own civil conflict raging on, and refugees from the CAR are fleeing into neighboring Chad and Cameroon daily. As torture, looting, kidnapping, assaults and extortion continue through the country, UN agencies are trying to provide all of the assistance they can, but it is imperative that the central government regain control of the country and put an end to the rebels' stronghold on power. As long as the rebels have unchecked power, they will continue to ravage the countryside for food, supplies, and potential human capital.